We enjoy comparing ourselves to others, don't we? Now you might not be able to pull annual repurchase rate out of your web analytics or business intelligence solution. But you might be able to pull annual purchase frequency out of your information system. 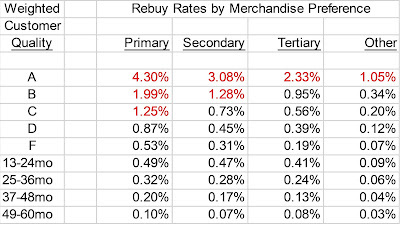 The attached graph indicates a relationship between annual purchase frequency, and annual repurchase rate. Annual repurchase rate is important, because it determines if you are in Acquisition Mode, Hybrid Mode, or Retention Mode. The mode you are in determines the type of business model you operate. It determines your sole purpose in life as a marketer. If your customers order fewer than 1.75 times per year, it is most likely that your business is in Acquisition Mode. You retain fewer than 40% of last year's buyers. Your job is to constantly "fill the funnel" with new customers, or your business won't grow. If your customers order between 1.75 and 3.00 times per year, it is most likely that your business is in Hybrid Mode, the most enjoyable mode for an executive to operate. You balance customer acquisition and customer retention activities. If your customers order more than three times per year, it is most likely that your business is in Retention Mode. Roll out the loyalty program, because you have to find a way to increase annual purchase frequency --- you're not likely to move the annual repurchase rate much. The table below allows you to identify if your annual repurchase rate is above or below average. 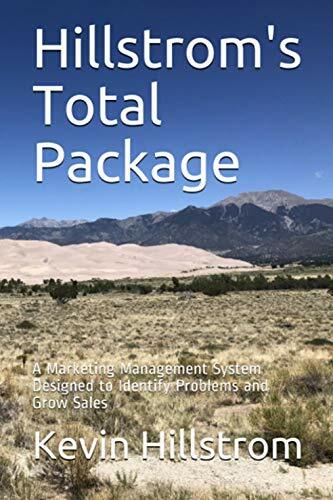 Here are approximate averages, given annual purchase frequency (your mileage will vary depending upon your customer acquisition strategy and merchandise assortment). 24.00 Annual Orders = 87% Annual Repurchase Rate.